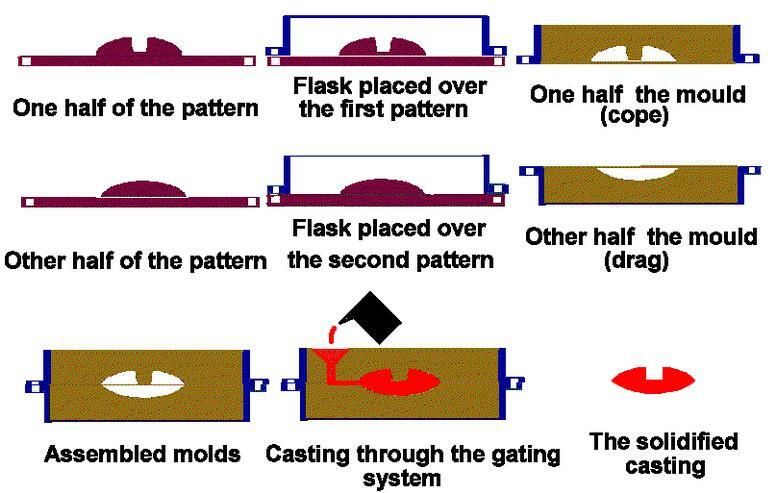 The sand casting or sand molded casting is a foundry process where reusable Pattern normally made up of wood or similar materials are used for creating the sand mold cavity into which the molten metal are poured to produce the product. The mold is normally made up in two or pieces depending upon the geometry of the component to be casted. Ideal applications: Suitable for less intricate, simple, loose toleranced components made up of different metals like steel, cast iron, aluminum, brass. I remember hearing that there is something that can be applied to the negative to allow the sand to more easily come loose…. wax or cooking oil? not sure if I missed it, but what additive is used to facilitate the mould hardening?